Fear and terror creep into the heart of a lovely young bride as she watches her husband change before her eyes – as she learns the tragic story of that other bride who was so like herself – as she becomes the helpless prey of a strange and relentless hatred. Swiftly the web of evil spreads until its meshes enclose – murder! Strangely enough, it is the murder that drives away the evil – while a twenty-foot wall of water washes away the debris of two almost wrecked lives. Copyright 1948 by Lucille Emerick. 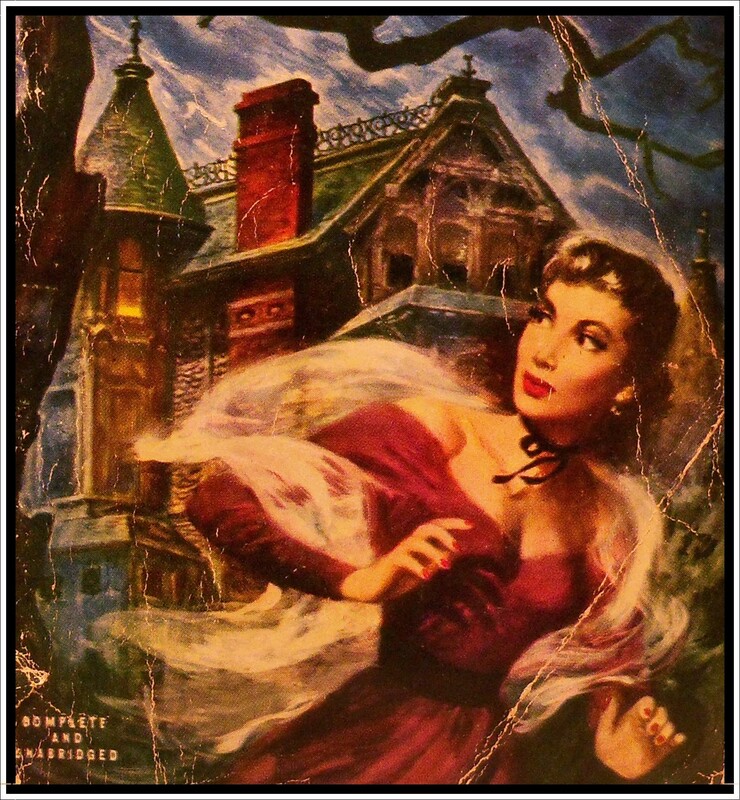 Cover painting by Robert Stanley. Dell Publishing Company, printed 1951. I have completely forgotten when or where I found this gorgeous gem of a book, but it stands out as one of the oldest examples of the classic ‘gothic romance’ cover that I own. Painted by Robert Stanley long before the hey-day of the 60’s & 70’s, when gothic romances were at their most popular, this picture is as sinister and storm-swept as any – with those deep, rich colours and airbrush effect combining to create a lush, dreamy feel that I love. According to The Book of Paperbacks written by Piet Schreuders, Robert Stanley often used his wife Rhoda as a model for his covers. My curiosity piqued, I looked up some scans of his work on the internet and she is beautiful! You can see what I mean from this fabulous Flickr gallery HERE. 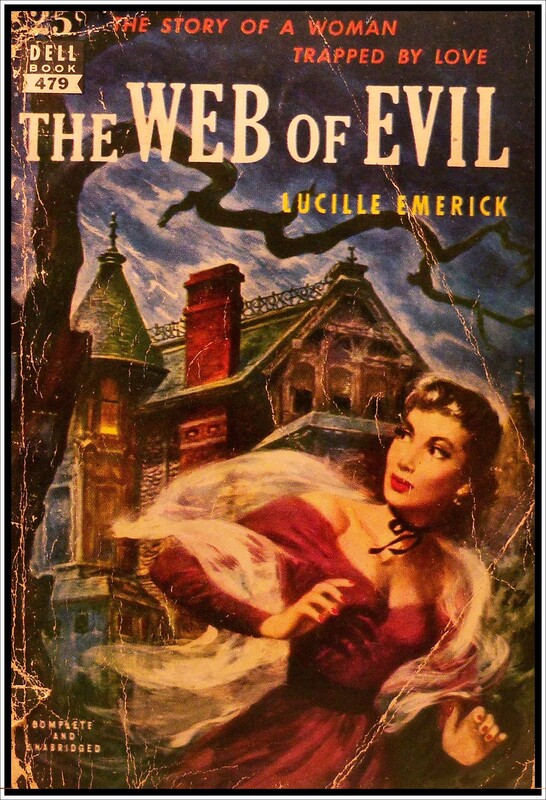 This edition of Web of Evil is one of the Dell Mapbacks – a series of paperbacks printed in the 1940’s to 1950’s, each with a map on the back detailing the scenes where the events of novel took place. Apparently Dell’s sales department hated the idea, finding it unnecessary and non-commercial and the practice was phased out in 1951. Personally I think they’re kind of cute and great for those lazy days when you’re much too hazy-headed to read a book – far better to just stare into the map and make up your own! Another feature common to this series is the list of story characters set out in the flyleaf, with brief descriptions of who they are. So in Web of Evil for instance we learn CAROLINE SPRINGER is a shy and pretty girl whose parents drowned in her infancy. Her leading man is JONATHAN WARREN; handsome, self possessed and at 41 he knows what he wants and what he stands for. RED KOVACS is a hot-headed young fire boss, blindly devoted to the cause, with a passionate hatred shining in his eyes, whereas AUNT ELOISE is a delicate and self-effacing woman who, fluttering nervously in the wake of her domineering sister Harriet, is relegated to her room as much as possible. These cast-lists are common in older romance novels and something I am not so fond of – overly twee and unnecessarily theatrical, not only do they undermine the story telling before you have even reached the start of Chapter 1, but I prefer to get to know the characters in a novel on the writer’s terms, as and when they appear in the story. Nevertheless, I love this cover. 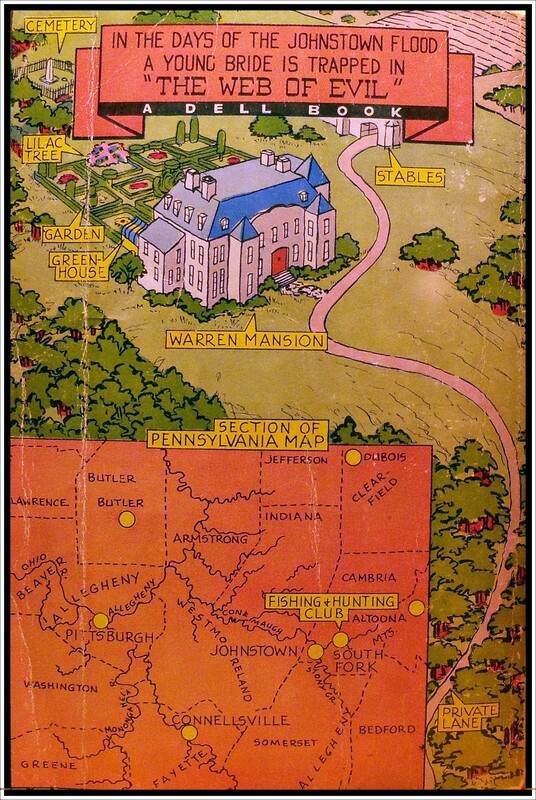 And with a map that features a cemetery, lilac tree and stables, I think it has all the makings of a very intriguing tale! 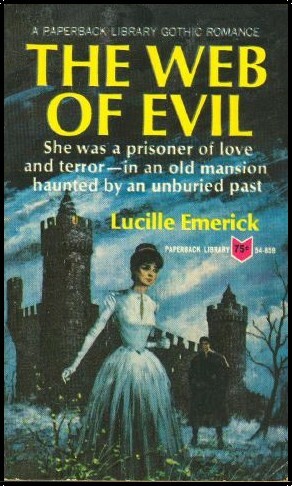 The Web of Evil was also published by Paperback Library Gothic in 1965.